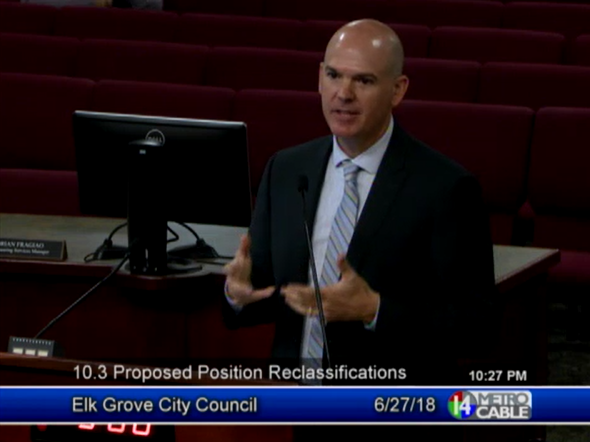 In a signal that the Elk Grove City Council has found their man for the vacant city manager position, at tonight's meeting they unanimously granted the interim city manager's request to open a new city hall department. By a unanimous 4 - 0 vote (council member Stephanie Nguyen was absent) the city council approved a proposal by interim city manager Jason Behrmann to upgrade two positions at city hall and open a new innovation department. One of the positions will see current assistant to city manager Christopher "C.J." Jordan's job classification change to Director of Strategic Planning & Innovation, and the other position, which is currently vacant will be changed from administrative analyst to Strategic Planning & Innovation Program Manager. During his presentation, Behrmann said the move will cost taxpayers $44,000 more in annual salaries, but actually will save taxpayers money. Behrmann reasoned that Jordan, and the person who eventually fills the other position, will be able to spur on innovation at city hall that will lead to great taxpayers savings. "I feel like it is something we can do that will pay big dividends as an investment in the city's future," he said. In the council's short deliberation, Hume expressed surprise on the additional taxpayers' burden for the salary hikes. Hume noted that the position which is currently vacant has a salary in excess of $100,000 with no supervisorial responsibility. "I love the concept, but it is the sticker price has put me in a little bit of a state of shock," Hume said. Notwithstanding Hume's brief criticism the council heaped praise on Behrmann's proposal and granted approved. Typical were comments from Council Member Steve Detrick. "Jason I am really impressed with the enthusiasm that you're coming forward with, outside of the box ideas, breaking down the silos, bringing the people together to be an integral part of the entire team, not just their organization," Detrick said. "So I commend you... you've taken the brains of this horse and been running full speed ever since." Although the city council has not released a plan for filling the city manager's position that was vacated with last month's termination of Laura Gill, allowing Behrmann to start a new department as the interim manager is a strong signal he will fill the position. "Innovation", Elk Groves new buzzword with a hugh price tag. What seems to be lacking is exactly what that means for the city and taxpayers/customers. Does Elk Grove even have an innovation problem or could it be an employee perception problem? The Elk Grove City Council is not fooling anyone! Jason Behrmann is going to be the next City Manager. So council members, do the taxpayers a favor, stop insulting us and don’t waste another $50K on a bogus nationwide search. Put that money towards the $330K payoff for Laura Gill – thank you Pat Hume, Steve Detrick, Darren Suen and Stephanie Nguyen for that taxpayer bill. According to Behrmann, Christopher “CJ” Jordan is going to be an innovative, inventive genius who will bring new ways of doing business to the city that will save money? Jordan has been with the city of Elk Grove for years. So, he hasn’t had any “great ideas” in the past finding ways to improve city services? So, did “CJ” just wake up because making over $125K a year wasn’t enough, but a $30K increase will start the pioneering juices flowing? Did anyone notice all the “feel good” clichés Behrmann used in his presentation? This was clearly a presentation where Behrmann used too many clichés, and in doing so, there were so many overused words that lost their meaning. And what happened to all the praise, year after year, that was lauded on Gill from the dais? From what we heard last night, especially from Detrick, it appears Gill was worthless and did nothing except collect a paycheck and Behrmann is going to be the end all, be all city manager. Fresh eyes, innovation, genius, it doesn't matter. Don't forget who butters your bread. If this scheme costs the developers even one iota, you're all outta here! Save them money however, and they will hoist you on their shoulders so fast, your head might hit the light fixture!